Monday was a long and wonderful day, the kind that makes it all worthwhile. The weather was sunny, there was very little wind, beautiful scenery and I had cool new sunglasses. I'd lost my sunglasses at some point over the past few days, hard to say when as I hadn't been needing them much until I got to Mull. Fortunately Tobermory is one of those towns that actually has shops (rare in the Scottish Isles) so the next morning I was able to buy some new ones, just in time for some sunshine to let me test them out properly. One other good thing Tobermory had was a bakery/delicatessen, and although I think the lady in the bakery got a bit annoyed with all my umming and erring (being spoilt for choice after many days of nasty stale co-op bread and packaged cheddar), I ended up with four rather nice looking white rolls and a bit of Camembert. 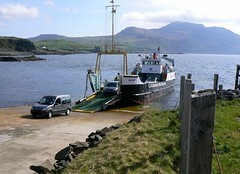 The ferry to Kilchoan was tiny, with room for about three cars which had to reverse on board. It was lucky the weather was good as there was no indoor passenger deck. Ardnamurchan was wonderful, and gave me the kind of cycling I can really get into. In the first couple of miles the road had started to ascend and I passed a walker who announced "It's a long hill". It really was. The road wrapped around the back of Ben Hiant and back down to the coast, where it stayed for the next fifteen miles, winding in and out of glittering bays, passing through forest, mountain and moorland. 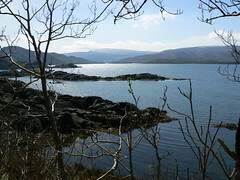 I stopped at Salen for a drink and a topup of water then headed northwards, off the Ardnamurchan peninsula and past lochs and forests towards the Road to the Isles. The Road to the Isles is not as great as you'd expect, well maybe as rail routes and big A-roads and rail routes go I suppose it's pretty scenic but after the little winding coastal and mountain routes I'd experienced in the past couple of days, it hardly compared. It wasn't busy but it was big, and they're making it bigger. The roadworks, huge dusty piles of rubble and the stench of fresh tarmac really didn't help matters. 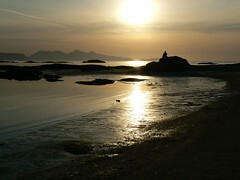 I eventually reached Arisaig after about fifty miles and around 7pm. I found a beach campsite nearby and spent the evening paddling and eating sausage sandwiches.